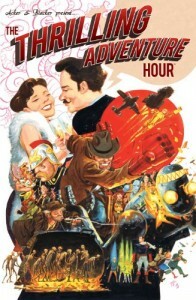 The Thrilling Adventure Hour is a long-running stage-show and podcast with an old-fashioned radio-drama sensibility. Every episode features recurring characters and serial adventures acted out by actors and comedians in front of a live audience. Although some familiarity with the podcast is helpful – hearing Paul F. Tompkins’ voice in your head as you read can only improve your enjoyment – this graphic novel version of the show doesn’t require much familiarity with the source material. I’ve actually only listened to a handful of episodes, and none of them were recent. Luckily, the show transitions well from stage to page. The writing is sharp, and the illustrations for each story are done by a different artist with a unique style. The book has a total of ten stories featuring the regular characters from the show. Each story takes its cues from common tropes of bygone radio dramas, then subverts them with humor. That mix of nostalgia and comedy might wear thin if it wasn’t clear how much affection the writers have for their subjects. I’m sure it also helps that these characters and stories were honed over eight years of live performances. My favorite of the bunch is easily the story of booze-hounds Frank and Sadie Doyle, who solve paranormal mysteries by accident while searching for their next drink with charming disregard for danger. However, I also thoroughly enjoyed Down in Moonshine Holler, with its cross of Preston Sturges and Shirley Jackson. My favorite joke was the Murdermen, though. Always in the mood for murder. The best part about this collection is that it’s the perfect primer for someone who has never heard of the show. They can read and enjoy it, then dive in to the show’s archives in iTunes. I know I certainly will. I’m also hoping to get a chance to see the live show sometime soon now that I live in Los Angeles.